We are introducing a new concept of USB adapter, an “UNIVERSAL adapter” able to work with the most used interfaces on today’s market, Serial TTL(COM) ports x4, Dynamixel interface(3-pins connector), SPI, JTAG, I2C(TWI), Enhanced Bit-Bang Mode interface and Pony Programmer (EEPROM memories, Atmel and PIC microcontrollers and more). 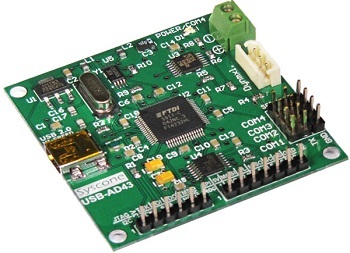 Based on FTDI’s 5th generation “FT4232H” USB Hi-Speed(480Mb/s) Four Channel USB to UART(Serial COM) IC, the USB-AD43 adapter provides complete driver support across Windows, Mac OS X, Open Source Operating Systems such as Ubuntu Linux. Other features include: USB powered (no power supply required), Protected/Buffered outputs, Independent baud rate generators, Transfer speeds of up to 12Mbaud, and up to 4ch interface combinations.